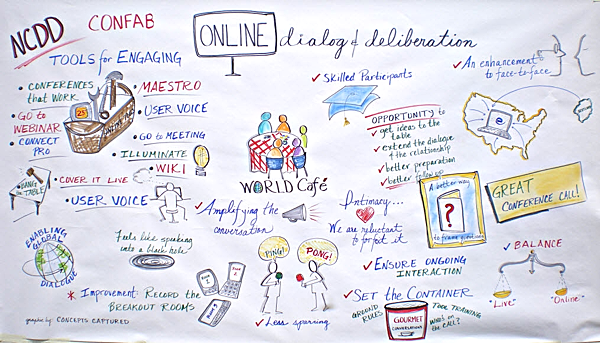 Visual Recording of NCDD Confab. Conferences That Work included at upper left! Poor call quality. Some callers are faint and/or there’s noise on the line. Any noise at any caller’s location, like someone yelling in the background or answering another call, is picked up and broadcast to everyone on the call. There’s no way to know when someone is about to speak; awkwardness abounds as people start to talk simultaneously. Only one person can speak at a time, and they have to address the whole group. There’s no way to know who wants to speak, to ask or answer questions. So my expectations were not high a couple of days ago, when I joined 77 people (!) on an “NCDD confab” on online engagement. NCDD is the nonprofit National Coalition for Dialogue & Deliberation, a network of over 1,200 members working on conflict resolution and public engagement practice. What a contrast! Instead of the usual conference call hell you’d expect on a call with nearly 80 people, our two hours together were surprisingly enjoyable, in large part because we used Maestro, a conference call / online tool that combines traditional conference call features with the ability to create small group conversations amongst the participants on the same call. The Maestro system allows the call organizers to easily create small breakout groups at any time during the call. During our call, we were twice split into small groups of 3-5 people to introduce ourselves and discuss a given question. Chimes and messages informed us when were halfway through our allotted time, and when we had a minute left to go. When the small group discussion was finished, we were smoothly reunited with the entire group. In addition, organizers can join any small group and ask or answer questions at any time. Individual telephones can be selectively muted by the Maestro system, so we heard no distracting sounds from participants’ phones. When the event organizers were speaking, all phones except theirs were muted. If they asked someone to speak, just that phone would be un-muted. The resulting call quality was excellent. In addition, the system’s call quality was uniformly high throughout our two-hour call. I heard no pops, hissing, or other annoying noises. Maestro includes a simple but effective backchannel method for call participants to signal conference organizers, by pressing numbers on their phone keypad. (There’s no annoying sound heard when people do this.) This can be used to quickly poll participants, to ask the organizers for help, to opt-in or out of a topic or choice, or to indicate that the participant has something to say to the whole group. We used all these options during our call, including: answering a four yes/no question poll of the entire group in a minute; queuing up individual participants to speak about their experiences; and opting in or out of having our emails made available to other group members. From the organizers’ perspective, Maestro Connect uses a web interface, which seems to offer an easy way to control the abilities I’ve described. Pricing seems reasonable; and a free 30-day trial is available, as well as discounts for non-profit and solo practitioners.If you’re into such things, Maestro Conference has an affiliate program, (and I am not an affiliate). During the call, I spoke to the entire group once, met and conversed with people in two small discussion groups, World Café style, and voted on questions that were asked. Sandy Heierbacher of NCDD and Amy Lenzo of World Café expertly facilitated the call, with a couple of assistants helping out as needed. The time flew by, very enjoyably. In conclusion, this service, when appropriately used, can turn the normal broadcast-mode experience of a conference call into a much-more participatory and interactive time for callers. I don’t have experience of managing a Maestro Conference, but, as a participant, it seemed to be a straightforward process with no glitches. If you have a need for a superior kind of conference call, this service is well worth checking out. This entry was posted on Friday, July 2nd, 2010 at 11:59 am	and is filed under Technology. You can follow any responses to this entry through the RSS 2.0 feed.You can leave a response, or trackback from your own site.